It's 07:55 in Bled, Slovenia right now. Lake Bled View of Lake Bled from the Hotel Golf. 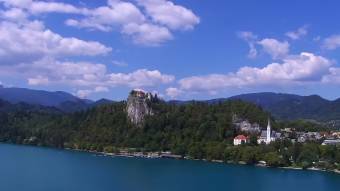 Bled: Panorama of Lake Bled, 0 miles away. Rudno: Ski Resort Rudno, 8.7 miles away. Pokljuka: Sports Centre Pokljuka - Rudno Polje, 9 miles away. Bodental: Familienhof Sereinig, 9.1 miles away. Bodental: View from the BergPension Lausegger, 9.1 miles away. Tržič: Kofce Mountain Hut - 1488m, 9.5 miles away. Bohinj: Vogel Ski Resort - Snow Park, 9.8 miles away. Bohinj: Ski Resort Vogel, 9.8 miles away.